workforce development and infrastructure - we can reach this goal." The workplace and the economy look very different than they used to, and they will continue to change thanks to technology and automation. The 21st century workplace demands require our students to be equipped and ready with the skills to succeed. Businesses all across Missouri stress the need to find solutions to develop a skilled workforce – preparing the next generation for high demand, high wage jobs. We need to rethink some of the ways we provide educational opportunities for our students – offering more certificates, apprenticeships, and alternative credentialing programs. In order to ensure Missouri is on the right track, we must give our students and workers the skills and tools to be successful. Our schools play an important role in preparing our students entering the workforce, but in order to compete on a national level, we must push ourselves to do better. To accomplish our goals, we need to align the focus of our businesses, the education system, and government. We all must work together to provide better opportunities for those who are to follow. We have to efficiently connect different regions of our state because our biggest cities and our smallest towns depend on each other. By improving our infrastructure, we will have easy access to transporting goods throughout Missouri and across the nation. Using our rivers, interstates, highways, and airports, we will be further able to expand into new trade markets around the United States and the world. Our state’s highway system is the 7th largest in the nation and ranked 46th in revenue per mile. Missouri’s infrastructure needs are long overdue and now is the time to take action. Expanding infrastructure also includes creating access to high-speed internet. Missouri ranks 42nd in broadband availability; 1 in 5 Missourians lack access to high-speed internet service. 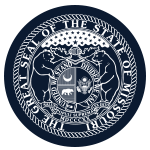 Making this crucial improvement will allow rural and urban regions to thrive together, and it will give every Missourian access to being a competitor on state, national, and global levels. If Missouri is going to compete, we need to compete to win.